I offer below a window into one pathway for entry into the project based learning method of instruction. It is not a recipe; it is a footprint in the sand. "I have gone this way. Come and walk beside me." Designing a driving question might be the hardest part for teachers new to PBL, so my best piece of advice is to proceed from your passions. I am passionate about travel and history and all the different types of learning that I can put in my units when we study other countries. I can't get enough of it. I won't be happy until every flag from the world is hanging outside my little classroom door. Your passions might be different, but if you are passionate about what you choose to study, you will find a way to weave the content standards through your projects. It is okay to start with just a "cool idea" in mind. You have permission to start there. I do one large PBL per trimester. I start by planning my central theme and then draft my three PBL social studies units with corresponding science standards connections, literacy connections, math integration, and as many other connections as I can: art, crafts, dance, cooking, music, languages, manners, etc. This will not be the sum of my unit, as more lesson plan ideas will be generated as I purchase new books and learn more about my topic myself. For example, when we studied Hawaii, volcanoes were the natural earth science connection and doing the hula dance was a given. I create long brainstormed lists of lesson plan ideas that I make each summer. This is also my chance to start thinking about field trips and guest experts I could use. In PBL, you always plan more than you will need for a unit, but you have to leave room inside your head to go off on a tangent if that is where you need to go. You can always save the lessons you planned for the next time you do this unit. In reality, I never get to everything I planned, but it is better to have too much than too little. I like to use the connecting questions "What is a country?, What is a culture?, and How does a culture change over time?" I could really use this structure with any three countries which have a natural connection. For example, this past school year we traveled from Spain to Mexico to the USA. We studied Goya in Spain and then compared his work to Diego Rivera's in Mexico. We used our critical thinking skills when we asked questions about why artists chose certain subjects and how art reflects your culture and the values of the time and place you live in. We traced the Hispanic culture as it traveled from Spain to Mexico and then up to the United States. How do time and space effect culture? Is the Hispanic culture of today the same as the Hispanic culture of Spain and what will the Hispanic culture be like in 100 years in America? The kinders are perfectly capable of having rich conversations in these areas at their own level. They can begin to compare and contrast. They can begin to guess at interior motivations. They can begin to make judgments based on evidence. They can begin to argue and support their points. We are giving them early exposure to key academic vocabulary: compare, contrast, predict, support, argue, evidence, bias, etc. Did anyone see language like that in our pre-packaged curriculum from the state? I certainly didn't. In The Flat World in Education, Linda Darling Hammond talks about the importance of hiring highly educated teachers and then giving them autonomy in their classrooms. That has been the recipe, she asserts, that has put countries like Finland at the top of the PISA testing in which the United States now ranks as 17th worldwide. Teachers must now use this new autonomy under the CCSS to develop rich units that they are passionate about teaching. You need to come up with a driving question that is broad enough to have more than one right answer and that lends itself to some feature of voice and choice inside the project. The Buck Institute books listed on my Resource page and the ﻿Differentiating Instruction﻿ handbook also contain lists of examples of good driving questions. There are as many ways to begin a PBL unit as your imagination can think up. Here are a few ways that I have begun my PBL units for you to see as examples. There is no right answer as to what qualifies as an entry event. You get to decide if you think it will generate interest and excitement in your topic. For our Japan PBL - We went to Quarryhill Botanical Gardens in Sonoma which has a rich variety of plant species from all over Asia including Japan and China. Then we went to lunch at a Japanese restaurant a mile down the road and children got to try real rice sushi rolls, veggie or fish, green tea ice cream, edamame, miso soup and Japanese noodles. We used chop sticks and practiced our manners and our new Japanese vocabulary of konichwa and arrigato. We wrote thank you letters to the restaurant owner for his hospitality. These authentic reasons for writing is what it is all about in PBL. We also got inspired by the lake with the little bridge and boat and ended up painting beautiful reproductions of Monet's "Japanese Bridge". For our Spain PBL, we had the Soul Flamenco dancers from Santa Rosa visit our little school on the mountain and help us travel virtually to the country of Spain as they danced the flamenco and played the guitar for our whole school. The school assembly funds helped to pay for this one! Unfortunately, I accidently erased all my video footage of their fabulous dancing. "Que sera, sera!" We'll just have to ask them back for an encore performance! We have had so many guest speakers and experts visit our classroom both for entry events and as part of continued learning in our units. Once you put the word out that you are doing a PBL and are interested in having guest speakers, the whole school community gets involved. It is one of my favorite features of PBL. Put a little blurb in your school wide newsletter or online website. Get on the phone and call experts in your local community. This is where your unit comes to life! For Spain PBL, we hooked up with People to People International to get a classroom in Spain as pen pals. Click on the photo above to access their website and sign up to receive pen pals in your own classroom. Also, check out the ﻿Edutopia﻿ video below to see how exciting getting a letter or a package from another country or state can be! Again, this can be used as an entry event or just as part of your unit. For China PBL we watched a video showing Chinese acrobats and the kids were literally jumping out of their skin when they saw the moves those acrobats could make. It created a sense of wonder and other worldliness that captured their imaginations and set us on the road to our first Chinese language lessons online where we learned how to say, "Nihau" and more. We actually got to see real Chinese acrobats perform at our school the following school year at another school-wide assembly. Talk about bringing the world to your classroom! 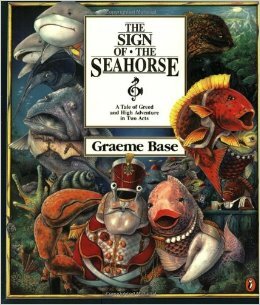 I started my Ocean PBl with a gorgeous book titled The Sign of the Seahorse . It is really a play that is very engaging and perfect for introducing kinders to the writing genre of plays. The book became the inspiration for our culminating project, our ocean wall tarp that now serves as a wind barrier on in our sand box. We started our Mexico PBL by looking at Google images of the murals of Diego Rivera and then comparing them to the paintings we had done earlier in the year of Goya's little boy with the leash and birdcage. My kids get a lot of practice with painting in connection with our PBL units. We learned the song "Fong Swei" as part of the body our China PBL, but you could use a song as the entry event. The Buck Institute suggests that more than one "entry event" might be needed to sustain interest in a longer PBL unit. For our Hawaii PBL, the father of one of our students offered to bring in real artifacts from a trip he made to the deep interior of Papua New Guinea. Kids got to try on bone necklaces and real a real fur headdress. How cool is that? For Japan PBL a co-worker, Brianna Kauble, brought in her Japanese umbrella and real carved wood sandals that each student got to try on and walk around it. Another co-worker, Jeanne Baswell, brought real Koa nut bead bracelets back from her vacation to Hawaii. A mom, Sara Desmond, brought in lace scarves for our Spain PBL and her mother, Mrs. Cunningham brought us a toy double decker red bus and gobstoppers for our Enlgand PBL. Carolyn Sanders brought us a beautiful Japanese kimono that a child had worn and real Japanese sandals from before WWII, and for our China PBl she brought us a beautiful piece of shell art with Chinese writing on it. Mr. Forgie brought in his collection of realia from Scotland for National Tartan day, including a belt buckle and a sporren. Whether as part of an entry event or for building background knowledge in your project content matter, Realia is an excellent tool to use at any grade level. Unplanned Entry Events - How Does that Work? Entry events can either be planned by the teacher or arise from real-world situations, student interests, or problems. Both avenues for entry into a project are acceptable. Teachers, myself included, are people who love to plan. Planning during the summer for the following year is one of my favorite things to do. This is not an aberration. Most teachers I know love the project planning process and more specifically, we like being prepared! How is it, then, that a project can simply be generated by authentic student interests and inquiry? What about the planning!? Based on my research, it is perfectly acceptable to begin a PBL unit based on a problem that naturally arises in your classroom. Unfortunately, I can't speak with authority on this issue because I have only done units that I have planned ahead of time, but do have experience with constantly modifying my units during the course of the PBL. I imagine it is somewhat similar. Look at the example in the video above to get an idea of how an "unplanned unit" might develop and take shape. The video clips above were filmed during our PBL England in which we asked the driving question, "What is a country?" The word country is packed with underlying meanings, schema and different sets of prior knowledge based on culture and other factors. I love studying other countries and creating a sense of global awareness in our youngest students. We travel off our little mountain virtually, and we learn about the history, music, food, dance, architecture, language, sports, arts, crafts, famous scientists, etc. of each country we visit. It is a rich curriculum that plants a seed early in each student's educational life to prepare them to exist in a future global economy. We could just study the US, and our country, states and cities, but it is so much richer to study other countries and then compare and contrast them to our own country and culture. Let's dive a little deeper to see HOW we develop collaboration and communication skills through the the project based learning method at the kindergarten level. You can see that there are many times in these clips when I could have taken the decision making process away from the team and "solved the problems", but you can't create agency in students if you are not willing to let go of some measure of control in order to create autonomy. I believe there is a direct correlation between agency and autonomy. Of course, when it gets to tears, I have to put down the camera and give a hug and intervene more, but you can see that all three groups represented on this one day, got into troubles and worked their troubles out. That is what it is all about in PBL. We celebrate our problems and work towards solutions, their solutions, not mine. We were building a castle on the face of things, but what we are really building is collaboration, communication, critical thinking and creativity skills. As part of teaching Global Awareness in my classroom, I come up with a general theme like European, Asian or Hispanic studies. Then, I ask connecting driving questions: "What is a country, what is a culture, and how does a culture change over time?" I could really use this structure with any three countries which have a natural connection. For example, I had a high Hispanic population this year, so we traveled from Spain to Mexico to the USA. We studied Goya in Spain and then compared his work to Diego Rivera's in Mexico. We used our critical thinking skills when we asked questions about why artists chose certain subjects and how art reflects your culture and the values of the time and place you live in. We compared traditional art like painting to the work of master pinata makers who use paper scraps gathered from old newpapers. The kinders are perfectly capable of having rich conversations in these areas at their own level. They can begin to compare and contrast. They can begin to guess at interior motivations. They can begin to make judgments based on evidence. They can begin to argue and support their points. When we studied Italy, we looked at the City of Venice, and I read a passage in an informational text that related how the city of Venice was at risk from rising sea levels. I asked the kinders to think about what the town people might be able to do to save their town. Their answers sent a chill through my body. One suggested that they build a wall to keep the ocean out, another suggested that they raise up the town, a third suggested that they move the city somewhere else. All three of these potential solutions are ones that are being researched by adults. I am so happy to relay this experience here as I was not able to capture it on film. This is why I call my site kinderGATE, because I think teaching should precede from the assumption that if you teach them all as if they were categorized as "gifted and talented", then they will rise up to meet these high expectations, regardless of language proficiency or economic class. Universal Design for Learning (UDL), also often called "differentiating instruction", fits perfectly with the project based learning method of curriculum instruction. A major tenet of both PBL and UDL is giving voice and choice to students to increase motivation and effect positive outcomes based on varying learner needs and talents. I may have a second language learner who could not succeed in making a tri-fold flyer that was heavy on text, but that same learner could express themselves, their ideas, and their takeaways from the unit by downloading photos that represent the main ideas and placing them in a digital tri-fold with teacher or aide assistance. In education, giving the same education is not giving an "equal" education. You need to differentiate to reach all learners where they are and move them forward. Let's look at this short video that explains UDL. I want to share this second video below because it speaks to the heart of why we as teachers need to believe in Universal Design for Learning. The title of this TEDx is "My philosophy for a happy life", but pay attention to the first part in which the high school student is thwarted from his dreams of playing in the marching band. There is a happy ending; his family helped him to get what he needed so instruction could be possible. The point is that every child with special needs might not be so lucky, so we, the teachers, have to be the person for that child who figures out a way to "retrofit" whatever obstacles are in our way so that each student can access the all of the curricular opportunities. This video is also an excellent example of the "mindset" (﻿Mindset by Carol Dweck﻿) that we want to help create in all our students so that they can thrive no matter what obstacles life throws at them, because there will be obstacles. In the YouTube example above, I used a video camera to film kids in front of a green screen reading pages they had studied at home. We practiced reading our cards with partners and to the teacher at school, too. We wanted to make a collaborative group presentation titled "The Story of Hawaii" for our Hawaii PBL You can see that the technology enabled me to ﻿scaffold﻿ them to a higher level than I would have been able to without it (Vygotsky). Because you can have several "takes" when filming, you can reduce the students ﻿affective filters﻿ (Krashen). They don't have to get so nervous, because they begin to understand that we can delete that "take" and do it again. Notice that we are not using technology here just for the sake of learning how cool green screening is; we are using it to help us scaffold the learning to a higher level. Listen to some of the rich vocabulary that these K-1 tackled: refuge, polytheistic, ceased, missionary, etc.! This is the type of rich learning you get when you embed content learning in a project. Kids understand the end goal, and they reach for the stars. Note the little girl who reads about the endangered Hawaiian Monk Seal. Her lips are moving, but she is not really reading. She felt nervous to read in front of a camera, so we modified the lesson so that she could pretend to read in front of the camera (just moving her lips), and then I filmed only her voice reading her flash card sentences. I spliced the two together. This student was very shy and would never have got up on stage if we had done this presentation as a live performance, but here, she is able to be successful and part of the team final product because we differentiated the process for her. Similarly, a few of my youngest students could not read off cue cards yet, so we differentiated for them by helping them repeat their sentences and then using multiple takes to weave their coloring page information together. You can hear one student prompting her teammate with the word "taro". When your project is done, it is good to look back and reflect on the process. How can you do this at the kinder level? You can have them draw a picture to represent what they learned, or have an adult scribe their thoughts. You can also use video to capture their ideas, too, as I did here. In these video clips, we see glimpses of different kinds of learning. Some learned collaboration skills and teamwork. Some learned how to get what they need or how to say how they feel. And some said it was hard but they kept going, persistence. My favorite clip is when Maggies says, "I learned that...England is a country; I thought is was just a word." Bingo! These are the deeper understandings we are looking for when we use the project based learning method. She has a meaningful understanding of the fact that there are other countries and peoples in this world and they are different from her own. It's only kindergarten, but it's a beginning on the path to global awareness.